Insane Labs Pennywise is a state-of-the-art preworkout formulation in the form of powder that contains creatine monohydrate, caffeine in 3 different forms (anhydrous, citrate and malate), reserved mix AMPiberry® based on Juniperus Communis, Russian Estragon, theacrine, extract from Rauwolfia Vomitoria standardized to alpha yohimbine 90% and Hupercine A. This formulation adds strength and energy and enhances the training pump effect. What is important, in this preworkout product there is no beta-alanine and because of that the characteristic phenomenon of skin tingling is gone, which for some people was vexing. Creatine monohydrate supplemented in the around-training periods improves the efficiency of the muscle apparatus, contributing towards the increase of the strength and muscle mass. During the performance of an physical activity with increased intensity the necessary energy to resynthesize ATP comes mainly form the simultaneous anaerobic glycolysis and phosphocreatine decomposition. Nevertheless, during the workout the renewal of ATP from phosphocreatine is decreasing, almost three times faster compared to the pace at which glycolysis occurs. Creatine supplementation during intensified exercise increases the organism’s capability to produce ATP and because of that can cause an elevation in strength level and muscle mass. Caffeine blocks adenosine receptors in the brain, which results in limiting the symptoms of fatigue and allows for increasing activity. Besides that it has a beneficial influence on the oxygen management in the organism and because of that it can increase the exercise capacity. Among athletes, it is commonly used as a nervous system stimulating agent and due to its thermogenic properties it can support the reduction of fat tissue. Insane Labs Pennywise contains three different caffeine forms: anhydrous, citrate and malate (Infinergy™). Anhydrous caffeine is the purest form of caffeine which is quickly soluble, highly stable, and because of its bioavailability its effects in the organism occur fast (30-60 minutes after consumption). Caffeine citrate is characterized by excellent solubility (better than common caffeine). Malate is in turn a combination of caffeine and malic acid, which is highly bioavailable and supports the energy transformations in the organism. The combination of these forms means that caffeine available in the formulation is instantly assimilated by the organism which can use it to support the physical exertion. AMPiberry™ is a reserved mix based on the common juniper (Juniperus communis). This unique and effective component of the formulation works in synergy with caffeine, as well as causes the prolongation of the stimulating effects of product’s other ingredients. Because of it, one will not feel energy drops or jumps, but rather a constant and maintaining high level stimulation. Theacrine is another ingredient with a stimulating effect, which is similar to caffeine in action. Unlike caffeine, theacrine does not raise blood pressure. Moreover, it causes significantly longer stimulation. The biggest advantage of teacrine supplementation is the fact that the organism does not get used to it and each time the same powerful effect can be obtained. Extract from Rauwolfia Vomitoria standardized to a minimum of 90% alpha yohimbine. Alpha yohimbine (rauwolscine) is a nearly identical compound to regular yohimbine in terms of its chemical structure and its range of activity. This alternative form with slightly changed properties acts as an α2 -adrenergic receptor blocker and therefore supports fat burning. It is believed that alpha yohimbine is more effective due to the higher potency on the same receptor. What is more, it exhibits serotonin-like effects which result in improved mood. Hupercine A is a substance that easily crosses the blood-brain barrier, and because of that it reaches this organ swiftly. As a chemical compound, it has a high purity index, and therefore, even at low doses, it has a positive effect on the nervous system. Hupercine A inhibits the breakdown of acetylcholine, which indirectly causes an increase in its amount in the organism. Acetylcholine is a crucial neurotransmitter of the nervous system. This substance is responsible for the flow of signals between nerve cells and stimulates the nervous system, strengthening the ability to focus and memory processes. Acetylcholine is also a signal transmitter between nerve and muscle cells, responsible for the effectiveness and efficiency of muscle work. Russian tarragon increases bile secretion, improves its flow to the duodenum and reduces the tension of the smooth muscles of the digestive system and bile ducts. The addition of this ingredient also increases the secretion of gastric juice, and therefore improves the digestion and absorption of nutrients (including substances contained in the formulation). 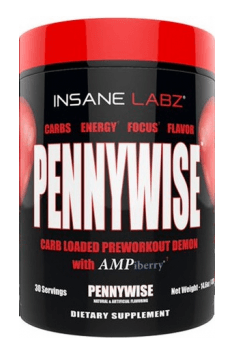 To sum up, Insane Labs Pennywise is a powerful preworkout stimulant, which contains mix of the most effective ingredients. The use of this product before training results in the improvement of general well-being, sharpening of concentration, reduction of fatigue symptoms and motivation to act. Because of its properties facilitating the fat tissue burning this product is an ideal solution for people being in the reduction phase. Dissolve 1 scoop (13.8 g) of the product with water and drink 15-30 minutes before planned physical activity. During the first days of use, in order to adjust the right dose, an individual tolerance on the formulation should be tested by applying the dose recommended by the manufacturer. Next, should there be such a need, the single dose can be gradually raised or lowered. Do not exceed 2 measures in one portion. This product has a strong stimulating effect and should not be used before sleep. Citric acid, silica, natural and artificial flavoring, calcium silicate, sucralose, FD&C blue #1.